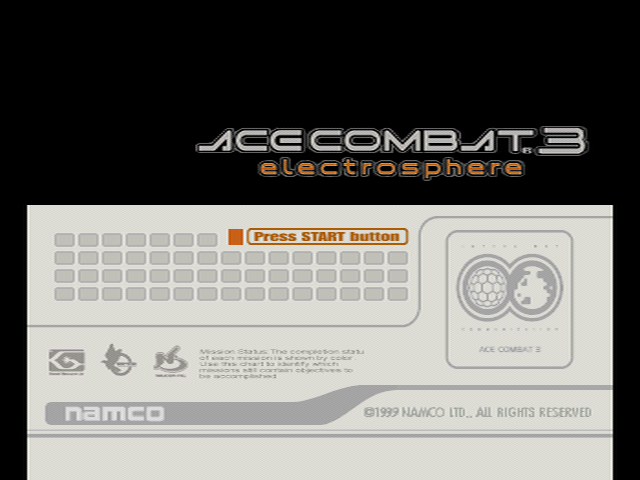 Marketed in Japan as a “3D Dramatic Flight-Shooting Game”, Ace Combat 3: Electrosphere is a stand-alone sequel and third entry in the PlayStation series. It spans 2 discs with 52 action-packed missions, numerous real-time and animated cutscenes and 5 different endings. The game is set in 2040’s USEA (the United States of Euro-Asia), a time where governments and the rule of law have been superseded by sheer economic power. Two competing multinational corporations, General Resource and Neucom, have gone to war after years of tensions, engulfing the whole country. You begin as a fighter pilot for the UPEO (Universal Peace Enforcement Organization), which tries to suppress this conflict, but as the war goes on, you discover that there’s more than meets the eye and your resolve will be put to the test. Things complicate even further when a terrorist group with nefarious goals appears. AC3E unfortunately lost some of its most defining characteristics for its single-disc Western release. Its branching storyline was condensed and all characters removed for the official localization, resulting in an experience that is drastically different.